I have always been curious about these home-delivered, healthy meal plans. 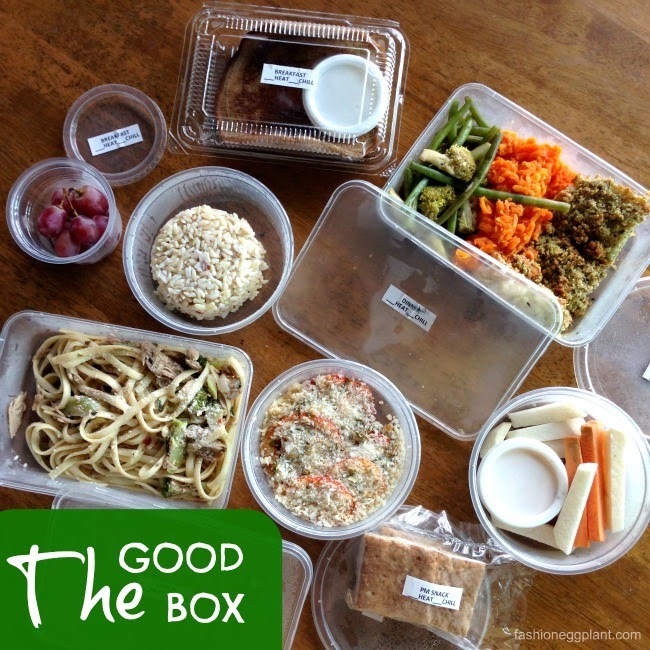 I was finally given a chance to try it when The Good Box PH approached the Mommy Bloggers Philippines Group and asked for a roster of bloggers to review a day's worth of meals. I was assigned for Wednesday. My meals arrived Tuesday night. Just in time for Glenda. At the time I wasn't worried because the weather was still pretty calm. I put my package in the refrigerator so I could heat them up the following day. Fast forward to a few hours later, I woke up to loud howling winds and a power outage. Cut the story short, half of my meals got spoiled so I only got to sample my breakfast and snacks. How unfortunate. Each meal is labeled with its calorie count plus info on proper heating. I stopped using the microwave in our house (for health purposes) so all our heating is done on the stove. I highly suggest re-heating your meals the same way, they turn out better and more fresh-tasting. Breakfast was Whole Wheat Pancakes with Light Syrup and Grapes. I had it with my usual mug of steaming black coffee. Despite the raging storm outside, this meal provided so much comfort. According to most nutritionists, you are supposed to eat something every 3 hours to keep your metabolism working at an ideal rate. Eating less more often helps you loose weight faster which is why The Good Box provides mid-meal snacks. For my AM snack, I had the Tomato and Zucchini Gratin. Also delicious despite being salvaged from non refrigeration for a few hours by then. Unlike a typical gratin, this wasn't as rich. I'm not sure what kind of cheese they used but it was pretty light and I think the majority of the topping was bread crumbs. Flavor relied greatly on the freshness of the tomato and zucchini which surprisingly held its own even after having it many hours post prep. By around lunch time, my pasta was already looking and beginning to smell funky so I decided to toss it out along with my dinner. I didn't exactly want to experience food poisoning during a black out. It was uncomfortable enough as it is. The only remaining thing I was able to salvage was my PM snack: Oat Cookies. Also yummy. It didn't really taste like Oat Cookies to me but didn't matter cause I enjoyed it anyway. It had a flaky consistency and it tasted very similar to something else but I just can't quite put my finger on it. A lot of people have the misconception that eating healthy usually translates to bland and tasteless. I have been on a healthy semi-paleo organic diet for a couple of months now and I tell you, our food has never tasted better. Fresh, organic ingredients are often naturally packed with flavor and you don't need to do much to make them taste good. The Good Box makes balanced, delicious, healthy and organic meals easily accessible for everyone. Below is their price list good for a week's worth of meals. Rate depends on calorie intake. There's a "Nutritionist" option/questionnaire on their website which will help you determine which package is perfect for you depending on your daily activities + fitness goals. 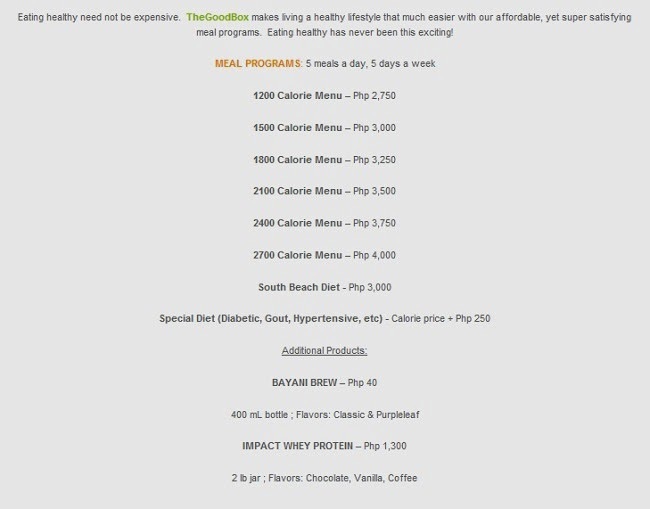 I did the math, a 1200 calorie diet (which is what was recommended for me) comes out at around P500/day. Not bad especially for single people who have don't have time to cook. And since it's pre-packed, it also makes it extra convenient to bring with you to the office or school. Macadamia Natural Oil is perfect for my hair because i recently got my hair rebonded and it needs hair treatment like this for a healthier looking hair. I wanna win Macadamia Natural Oil because my hair needs this treatment. My cat loves to play with my hair and i notice it easily breaks because its damage. And i can say its almost like a "walis ting" if not enhanced in photo that's why he loves it. He think my hair is a toy. I wanna win this to replenish the nutrients that were lost. I have a very nice hair so I don't use too much chemicals on it. I never dye my hair until i was tempted last year.and after that my lively hair turns to be dull, dry and had more split ends. But the worst is to have a dandruff for the 1st time in history. Now, I really regret dying my hair once. I wish I can bring back the hair I've got before through the help of Macademia Natural Oil. I'm really sick of my hair and I'm still on the process of looking for a solution. Could you help me? i recently permed my hair and sometimes it's frizzy if i don't put serum or oil on it after taking a bath. a friend who lives in the US recommended this brand a few months back but there's no available here in my place. seeing that there's a giveaway for this brand, i'm hoping to win so i can try it's wonders on my hair.